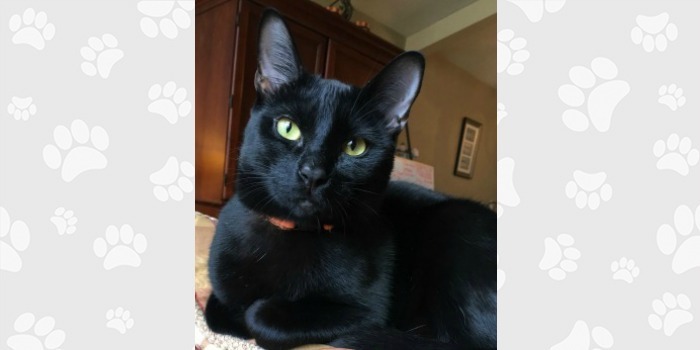 Here is Leith’s Happy Ending Story … We adopted 4 month old Leith in February of last year … we renamed him that day “Salem”. Salem joined our family of three other kitties and almost immediately began trying hard to make friends albeit under the bathroom door. It took no time for our 12 year old Orange Tabby and our 2 year old sister kitties to begin making him part of the their family. They all took turns cleaning Salem and sleeping with him. Immediately we noticed Salem was really special … by the time he was six months old we would awake in the morning to a bed full of “toys”. Salem wanted us to play fetch with him the second we awoke. He had a morning routine that included at least one hour of fetching. Salem though expanded his “cat toys” to stealing all of our girls’ hair bands and bringing us those also at night. He would go into their bathroom to find what he could and when they began hiding them in their night stand – he figured out how to open the drawer and find those at night too. I work from home and Salem provides lots of entertainment all day long. He has decided the cat tree (right by my desk) is his space and he enjoys playing on it all day. He also carries all of his cat toys up to the top perch – which he occasionally will allow his sister to join him in. When he is not hanging out in his cat tree he comes over to me and jumps up in my arms to be held on his back and have his tummy rubbed. He is a very loving cat! Salem has grown in leaps and bounds over the year. He is our mini-black panther. He is definitely the alpha cat. It’s hard to believe a year ago when we brought him home he was the scared little kitten who cried if we left him alone. Thank you for letting us share our happy ending!